Just like a furnace, in some homes, steam boilers are used to provide heat and comfort throughout the cold months. And, just like an HVAC system, annual maintenance can help keep steam boilers working effectively and efficiently when they’re needed most. However, there may come a time when you’re wondering if it makes sense to replace the boiler altogether. Your energy bills have been steadily on the rise. If you’ve noticing lately that your energy bills are getting higher and higher every month, this could be due the costs associated with the efficiency of your boiler. Maybe you’ve had it serviced regularly, but it’s still not working as well as it should and costing you more money as time goes on. This is a clear sign you should consider replacing it for a newer, more efficient model. The steam boiler is starting to look worse for the wear. Do a visual inspection of the boiler. Do you notice rust spots and discoloration? You might even notice some of the operating controls and safety devices are becoming faulty. The boiler is getting up there in years. The age of the steam boiler is one of the most important things to consider in regards to replacing it. Different types of boilers have different life expectancies. For instance, cast iron boilers can last around 20 to 30 years with proper maintenance, although it’s important to remember that the older the boiler, the less efficient it generally becomes. Today’s modern cast iron boilers are often far more efficient than those that are over 20 years old. You’re noticing some leaks. When visually inspecting the boiler, check for any signs that leaks are present. Rust colored stains on the floor under the discharge piping, for instance, can indicate excessive feedwater is causing a leak. This can easily lead to damage in your home, and replacing the boiler in this case is a better option than simply trying to repair it. It’s not the right size for your home. 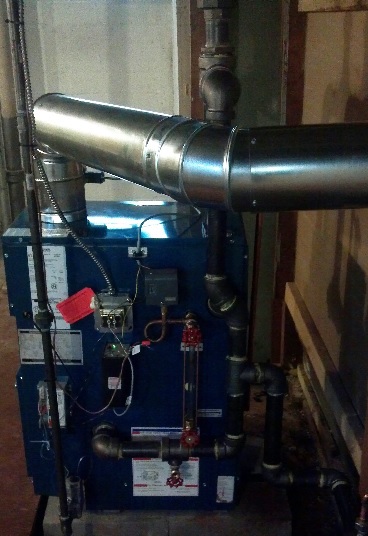 If the boiler is too big for your home, it will continuously operate in its low range. While this sounds like it could be a good thing, it’s usually far less efficient than a unit which is properly sized for the load. Depending on your particular situation, investing in a properly sized steam boiler can lead to substantial fuel savings and better overall performance, as today’s more efficient models, smaller capacity models, or even two smaller steam boilers might operate more efficiently. Do you have questions about repairing or replacing your steam boiler? The team at Efficient Heating and Cooling is ready to help! If you’re in the greater Cleveland area, contact our team today! Or, give us a call at 216-663-6462.